Why have I started to get this message "Invalid or duplicated Supplier SKU". The SKU is not new, not duplicated and not invalid. Would you be so kind to specify when this started to happen? Can you upload your WooCommerce status page, pls? Only one SKU allowed per product. If it already exists will not work. We've already fixed the issue and will be released on the next ATUM version. I've got the same problem. When I save a simple product or a product with variants (I only use these types of products ..) I get an error message with "Invalid or duplicated Supplier SKU." text. Are there a way to ignore this warning? ranone this error is all over google and not for reasons of ATUM. It is not about Suppliers SKU, but normal SKU I believe. 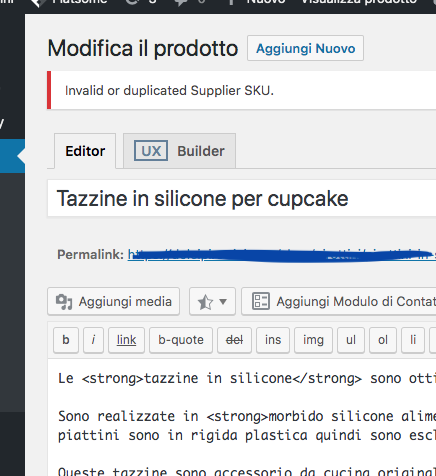 The SKUs are all different and I don't use WPML ... My shop is only in Italian. 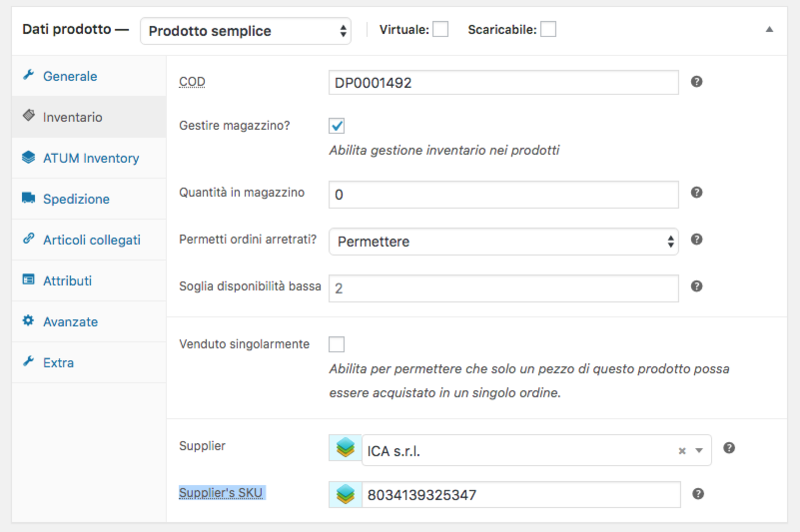 I think that the problem is really of Supplier's SKU because if I change the value selected in attached photo to a random number, it works ok and gives me no error. Somewhere in your db there is that SKU already saved. The above seems to prove it. I am sorry, but I am not sure how to help you from here. Open a private ticket, where you give my devs admin access, pls? They will walk you through to try and find the issue. Please, be aware, if we discover the issue is not caused by ATUM to fix it will be payable service. I also did the test to uninstall ATUM with the "Delete Data When Uninstalling" setting active. We have tested it all and it works fine on our sites. Can you upload the PHP error log and WC status page, pls? I think the best way to help you to determine what is causing this issue would be to debug it in your site. Could you open a private ticket here and provide us your admin credentials to be able to understand what is happening, please?